We’re in the midst of Draft fever with the 2019 NAB AFL Draft occurring tonight and tomorrow, so I thought now was as good time as any to run my eyes over how I think the first two rounds of a 12-team Fantasy Draft league may play out with captains on. We usually play the 3-4-1-3 (DEF-MID-RUC-FWD) structure for our mates league, so I’m doing this with that in mind and rolling with the snake style draft. At this point of the year, however, it probably doesn’t matter about league structure when looking at this. I am also doing some predicting of positions… which we should know in the next couple of weeks, possibly making this redundant when things are different to my way of thinking. These aren’t necessarily my rankings (to be honest, I haven’t started ranking), but a mix of my thoughts and also what I think other coaches will be thinking when drafting with the data available. I want to hear your thoughts in the comments. Post your predicted first round (and second if you can be bothered) in the comments and hit me up on Twitter. This was far from an easy selection. Mitchell had some off-season surgery on the shoulder he injured in the semi-final and the recovery time looked like it might be a while until he would be back training. He returned from his overseas trip and was straight into it showing no issues. This is enough for me to have no worries with taking the latest Fantasy Pig with pick one in a captains on league (captains off, you could consider Grundy). Mitchell’s last two averages of 127.1 and 129.1, playing all games, may not be matched, but even a 5-10 point per game drop would still see him pretty close to being the No. 1 scoring player. There is the argument that Grundy could go No. 1 in Draft this year due to his stellar season going at 120ppg – that we thought may not have been so good with the Cox-effect – but because there is the likelihood that the big Pie will be significantly better than other ruckmen. With some pre-season worries about Max Gawn having a new new rucking partner in Brayden Preuss at the Dees, Grundy could be 20+ points better than the next best ruck. The first DPP prediction in this list is Danger starting the season with FWD status. He will be borderline, but I’m going to put my kahunas on the line and say he’s going to be available up forward. This will be huge for Draft as the Cat averaged 117.9 and 120.5 in his first two years back home. This year Dangerfield averaged 106.3, which ranked him as the second best forward behind Devon Smith (who I believe will lose FWD status). Macrae was the second highest averaging player last year with 122.6 and is likely to be one of the first midfielders taken after Titch. With am injured 44 in his 2018 stats, he posted just two other scores under 107. You wouldn’t think things would change too much to make you think twice about backing him in as a 115+ midfielder. Maybe there’s some Essendon bias here, but Merrett was in the conversation for Pig status and taken in the top 3 picks the last two seasons when looking at ADP. Concussion in round one and some subsequent low scores thanks to some tags brought his season average from a couple of years around 118 to just over 101. From the bye on, Merrett averaged 114.1 and the addition of Dylan Shiel should see Merrett back where he was in 2016/17. There’s a chance he doesn’t go until the second round, but someone will take the punt much earlier than that. I would. 2018 was Cripps’ Fantasy breakout season. A couple of years just under the 100 average mark saw him shoot up to 109.3 finishing the year averaging 119.2 in the last 10 rounds. Docherty will be back into the Carlton side this year, but heading into his sixth season, many will expect even more improvement – especially those who like to look at end of season form when doing their rankings. Beams is a Fantasy stud. It’s going to be hard to rank he and his fellow Pies, but looking at Beams’ ceiling and the amount of points Collingwood midfielders amass, he should be at the pointy end. The knock will be the risk of the unknown and he is yet to play 22 games in a season. Beams scored the fifth most Fantasy points in the final 10 rounds in what was a trying year for him mentally. Being back where he wants to be can only be a good thing for his Fantasy numbers. Just hope for this coach taking him at No. 5 that Beams’ body holds up. Deliberately taken behind Beams is Treloar who has been one of the best scoring Fantasy midfielders of the last five years. Averages of 111.4, 108 and 108.4 in his three years at the Pies justifies a first round pick. Some coaches will be ranking him higher than Beams. 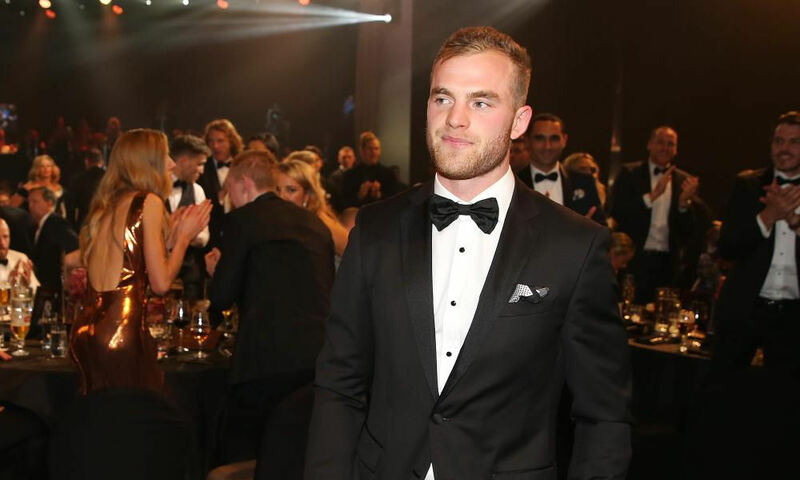 Personally I think Beams and Treloar will be the same if not better in 2019. Everything sounds positive about Docherty’s return after a year out of the game with an ACL. For the uninitiated, Doch averaged 116.8 from 22 games in 2017 making him by far the best defender. We didn’t get a chance to think about ranking him or what his return may have been this year, but he could have been a top 5 Draft selection based on that epic year. Most coaches will rank Docherty as their No. 1 defender… and once he’s off the board, a DEF run will start. Yep, here is the defender run! We’re going to see coaches work hard to get the top end defenders in Draft with a few going in the first couple of rounds. Laird had fantastic season averaging 107.8 making him the best, on average, ahead of Elliot Yeo and Angus Brayshaw who almost certainly lose DEF status. Laird is a ball-magnet and depending on how the Crows get their back structure working, he’ll be in the top couple of defenders available. One of the players that will benefit from the new kick-in rules. Lloyd ranked fifth in the league for kicks to himself with 44, but he averaged the most kick-ins per game with 7. This is a key stat. The kick-in stat is likely to count for whoever takes it whether they kick from inside the square or not, but regardless of this, not many players will be taking it from within the square anyway. Lloyd will most likely be the designated kicker for the Swans and we’ll bank his bonus points each week and see him once again average triple figures. A new found role off half-back saw Whitfield gain DEF status in round six and should have it from the get-go in 2019. He may, however, play more off the wing with the return of Zac Williams. Whitfield averaged 100.1 from his 22 games, his first time over the ton. Definitely worthy of a first round selection, especially on the turn in a snake draft as he may not be a reliable captain option due to his susceptibility to the tag. Was ranked higher last season, but will be a nice captain option for the team with pick 12. Missed a few games this year which bumps him down the list a touch, but Kelly’s average of 108.4 is a pretty decent base figure to be thinking about considering he went at 113 from 21 games the year prior. What does Shiel’s departure mean for him? There are a couple of questions but he could very easily be a first round pick. He looks like a little piglet and I feel that wherever Oliver goes in a draft will end up being a bargain. He’s played 22 games in each of the last two seasons posting averages of 101.5 and 109 in his second and third seasons. Most coaches would be backing Oliver to be a top 10 midfielder and going into his fourth year – plus some extra improvement from the Dees, Oliver may end up being a steal, even if it is early in the second round. The draft range for Gaff will be very interesting. The West Coast ball-magnet averaged 110.7 from his 19 games before his season ended due to suspension. Gaff still has two games to serve which could put some coaches off, hence his second round ranking. In a 3-4-1-3 league with 12 coaches, you could get away with drafting him a bit earlier due to the availability of free agents. At the end of the day, it’s just the first two rounds. He is a gun! Interestingly, Cogs averaged more than Kelly in what was his best Fantasy season to date. He averaged 110.3 from 21 games (concussion kept him out for one) and was a Classic bolter improving his return by almost 15 points per game. Like the three previous picks, a defender was taken by the coaches so the captain option here of Coniglio who scored 152 in round 23… coupled with the potential top defender in Docherty, who may be a few points better than the next, would make for a good combo. What are people going to do with Gawn? Am I jumping at shadows with Preuss’ addition to the Dees’ list? The Cox-effect scared us with Grundy last year and look how that turned out. Preuss isn’t the forward that Cox is though. It still baffles me that Preuss chose to be traded to Melbourne when Max is clearly the No. 1 ruck… and doesn’t really need back up. Anyway, if everyone in the league is scared then he’s going later in the second round as Gawn will probably be around the 100-105 mark for average. Still, even with Preuss, he’s the second best ruckman available unless we see Goldy get a second wind or Stef somehow increases his output despite Big O likely to get more ruck time. Man, the ruck conversation for Draft is going to be an ongoing one this pre-season. A couple of seasons in the mid-100 average range (106.7 and 104.8) will see him picked around this range but for those who like to have a look at back-end of the season stats, the younger Crouch brother went at 116.2 from his last nine games making him the fourth highest averaging midfielder in that time. I really don’t like this, but surely you’d think the coaches going a MID in the first round will look at a FWD here. Westhoff was the best of the available forwards (apart from Danger taken at three). He averaged 102 but I feel as though you’d be paying overs if you take him now. Despite being one of the few who averages over 100 as a FWD last year, Devon Smith was the best and Danger only gained FWD status at round 18, the 32-year-old had his best seas on by more than 12 points… meaning that he hadn’t even averaged more than 90 in any season since his 2007 debut. Not wanting to miss out after one of the few big forwards went, Menegola is a pretty safe bet to be around that 100 mark. He averaged 98.6 even with Danger and co spending more time up forward. Playing 22 games, Menegola was among the better forward selections for the year in Draft (as well as Classic) and should be again in 2019. The addition of Luke Dahlhaus will be an interesting watch. For me, I’d be hoping forwards stay on the board until the third round at the earliest. He won’t have DEF status, but position/role shouldn’t change too much for the Yeo-Yeo. He played every game to average 106.8 and went at 113.6 in the back-half of the year. Yeo can go missing, but only had a couple of games where he was having to play a defensive role that kept his scoring down. That round three match against the Cats was really a blip on the radar of a season that showed he had a high ceiling that saw him score more than 130 on five occasions. Coaches taking the SicDawg mid-late in this year’s draft were onto something. He averaged 95.6… but had a couple of suspensions and then missed the last few rounds because of a wrist injury. Sicily will be in that next tier of defenders that will be in that mid-90s average vicinity behind the big four taken in picks 9-12 in this draft. We saw Ross’ best Fantasy return after progressing to a 98.4 average in 2016 to follow up with 102 and then 107.3 this year. Coaches ranking on average will have him around this mark but savvy coaches will note that he has missed just one game in three seasons… and in the last five rounds he went at 126.3 to rank No. 3 for points scored at the business end of the Fantasy season. Let’s not forget the drama of the last round which saw a tie for first place in the overall rankings thanks to Ross’ 122. The fourth forward taken in this draft would be Isaac Heeney. Although only averaging a touch over 90 this year, he is every chance to average 100+ points going into his fifth season as there is a concussion score of 18 in this year’s average that brings his numbers down. The Heeney selection here is big because there may not be a lot of FWDs to average 90+ next season and with Hannebery gone, there might be an extra bit of midfield time. A lot more Draft content will be coming this pre-season. Stay tuned as we start getting prepared for our all-important Draft days in March ahead of the new season! Get discussing your rankings in the comments. Does anyone have a spare slot in an upcoming $ draft I can join – ideally 10 players snake? Pls let me know!